That is surely a mic-dropping line. Recorded music and broadcast television have utterly changed our relationship to art. The social ecstasy of cheering on a performer has given way to a personal relationship created wholly on the part of the spectator. While I am sure that a travelling troubadour carried the scent of the exotic about him, the relationship people felt for him was built in the moments of his performance. No princess had a stack of records in the Middle Ages, listening to them in her tower and pining away for this man on whom she has projected so much. Nay, I say. When the wandering minstrel appeared, you gave him a bath and made him sing for his supper. Maybe he got to sleep with the horses. If you think about the relationship that people have always had with precious objects, then you can trace a line from lockets and miniatures to record albums and mobile phones. Any image we conjure of someone opening a locket containing a memory is easily re-imagined as a person holding an iPhone. In both cases, the moment is personal and the originator of the focal object is distant. I’m really talking about is the way the artist has had to re-imagine their audience. Live performance may not have changed in the sense that the artist faces a group seeking a collective experience. But I can’t imagine an artist envisions the audience for their sitcom or YouTube video as a bunch of people sitting together. It’s all ones and threes adding up to millions. 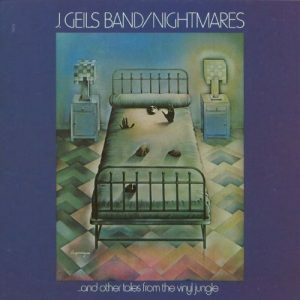 What’s all this got to do with the J. Geils Band? Part of their story is that they were this fantastic bar band that started out playing the heck out of rhythm and blues. They made a number of great albums and then finally broke through after more than a decade with an album that sort of sold out and sort of did not. Through the purchasing choices of my elders, I had listened incessantly to some of the earlier stuff, so I was well-prepared for their explosion in popularity. Yet, I had created some sort of weird personal relationship with the band because I was always listening to them in my room. Really, I didn’t find a lot of affinity for the band among my contemporaries until Love Stinks. So, it was just me and them and a couple AOR DJ’s. Over the years, I became inured to any bad reviews or unfortunate news about the band, because we had a history together. I knew that it was an entirely one-sided thing, but that was all right. They had thought about someone like me for maybe a moment when they were in the recording studio. You’ve Got to Check This Out is a blog series about music, words, and all sorts of artistic matters. It started with an explanation. 98 more to go.